Watches. A lot people used to wear them, because a watch had two great functional purposes: giving you the current time instantly, and providing a quick, easy, and almost universally recognized way to socially cue that you're becoming impatient / need to go / it's getting late. A lot of people actually still wear watches, but by and large, the reason has changed - it's mostly about fashion. For some people, maybe it was always about looks, but now more than ever the watch is, in any functional sense, obsolete. We carry smartphones, and those do a lot more than just give the time. Sure, a watch can make a good backup clock if your phone dies or you need to check the time more discreetly, but they're just not as important as they used to be. So began the smartwatch era. The idea was simple: take that empty or underutilized wrist of yours and slap a tiny computer on it. Brilliant! Well, maybe. Smartwatches are still in their infancy, relatively speaking, and while Samsung isn't the first big smartphone OEM to get in on the smartwatch game, it's probably going to be the first one most people end up remembering, at least if Samsung puts in its typical advertising effort. With speculation that Apple and Google are looking into smartwatches, it's not hard to understand why Samsung has created the Galaxy Gear. What is hard to understand, though, is just why you'd go out and spend $300 on what essentially amounts to a beta product. 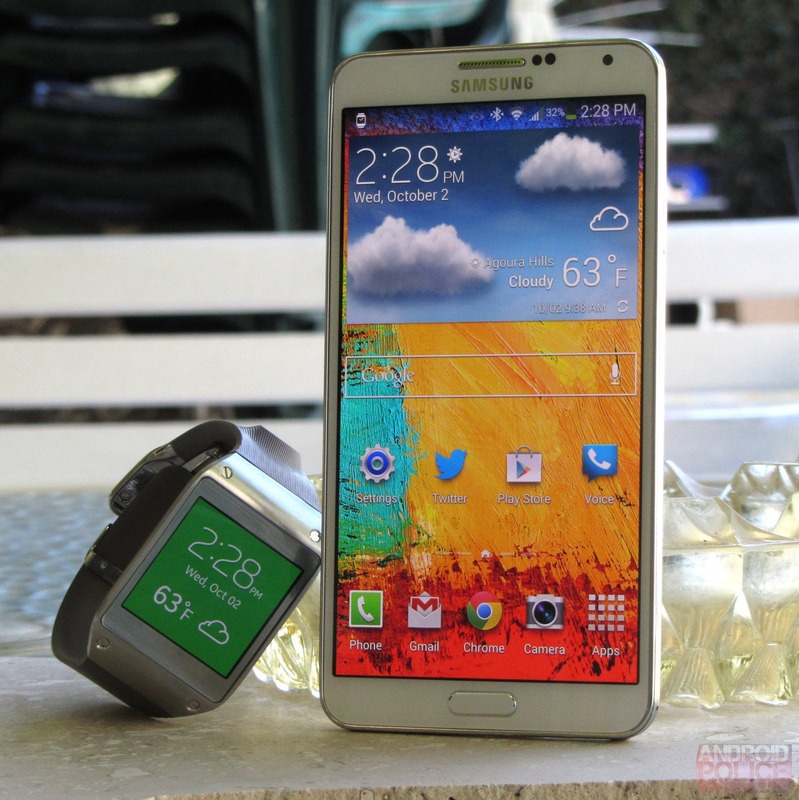 The Galaxy Gear appears well-made, it has a nice display, the camera is usable in well-lit situations, and the loudspeaker and microphone are good enough for phone calls in a pinch. The battery life is actually pretty decent, and the navigation isn't terribly unintuitive. 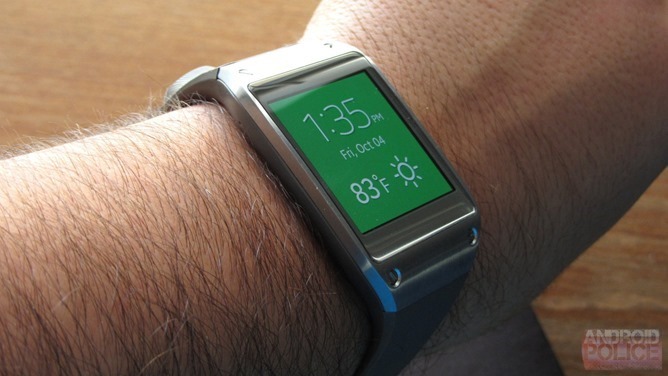 Dare I say, the Galaxy Gear could also look worse. 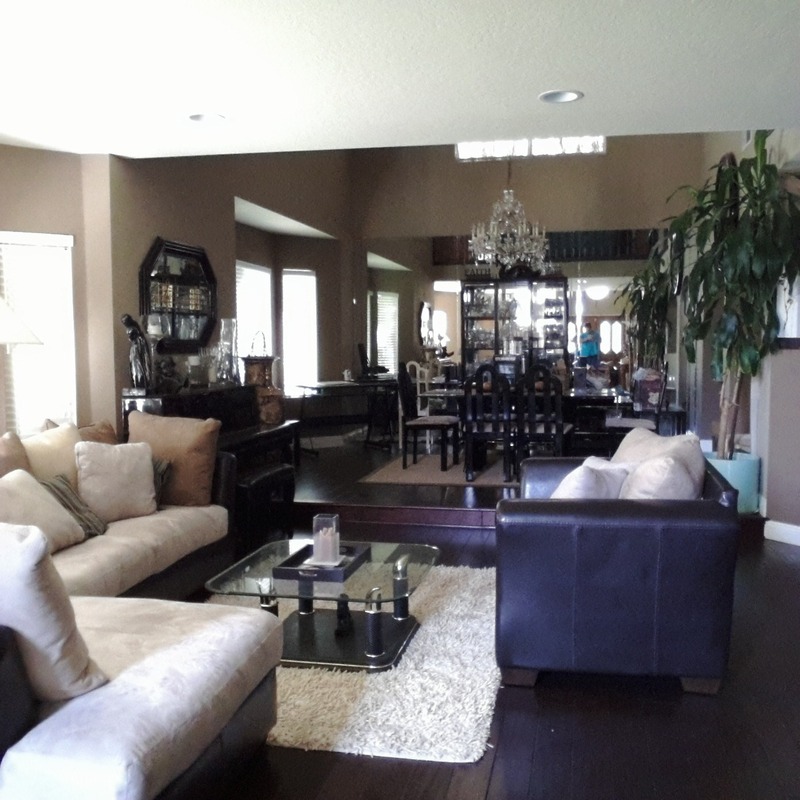 It's not pretty, but it doesn't look cheap or particularly outlandish, either. Sounding promising, right? 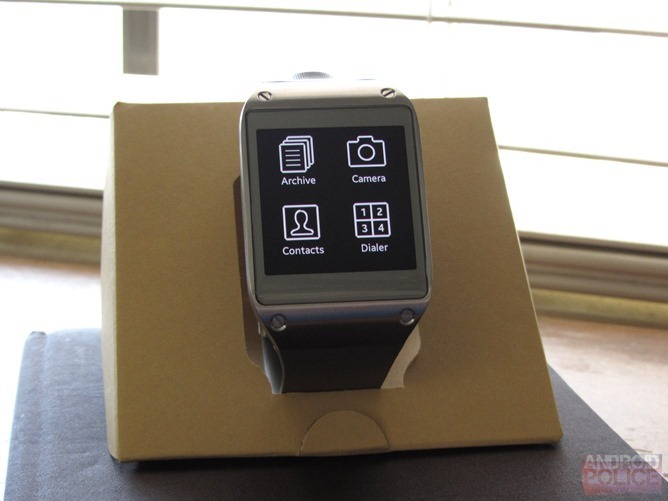 It's too bad there's not a single thing the Galaxy Gear does that actually makes me like it enough to want to use it, though. It's like Samsung designed the hardware, built the OS, and then had a very hard time figuring out just what to do with this product. And when the manufacturer has a hard time figuring out how to make the product compelling, that generally doesn't bode well for its continued support and development. Build: This is the most tightly-assembled Samsung product I've ever seen. The Gear is constructed to some pretty exacting standards, and feels incredibly tough, but also quite premium. Battery life: I think with light usage 3 days is reasonably doable, and that's not bad at all - nor is it extraordinary. Connectivity: I've had no connectivity issues with the Gear and my Note 3 at all, the Bluetooth LE connection has been solid as a rock, even on phone calls. Auto-lock: You can use the Gear as a proximity lock for your phone, if it's too far away, your phone goes into pattern lock mode. That's pretty cool. 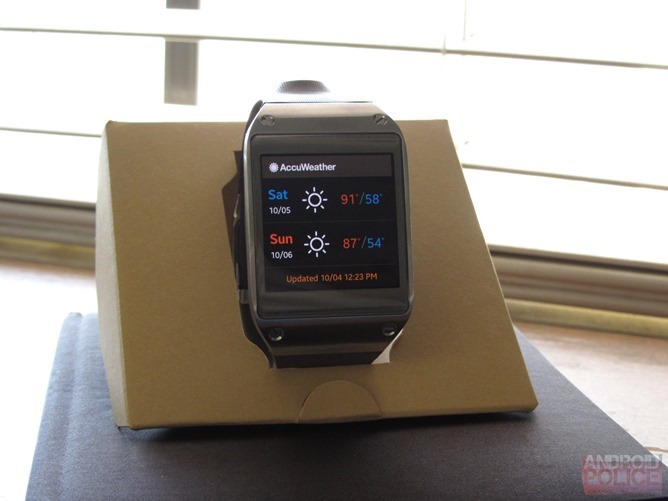 Display: Bright, vivid, and extremely high DPI for a smartwatch (277). Camera: It has one and it's usable. 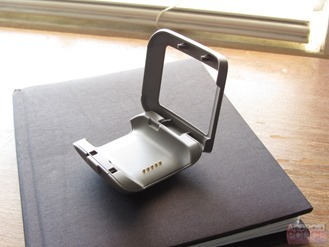 Charging cradle: You have to carry a specific piece of gear to charge the Gear, in the form of a really cheap, flimsy charging "cradle" and it really doesn't make sense. There has to be a better way. Notifications: See the section in Software devoted to notification handling. It's a mess on the Gear. Slow: The Gear feels slow and unresponsive a lot most of the time. This does not a good user experience make. Kind of useless: I have tried to find a way to integrate the Galaxy Gear into my life. To let it solve problems. And really, aside from auto-lock, it solves none of my problems. It just doesn't seem like a product designed with a goal in mind, it exists only for the sake of existing. 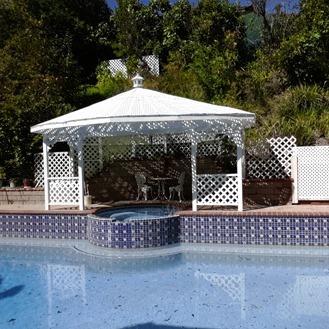 The primary housing of the Gear is constructed out of stainless steel, with a plastic underside. On that underside are the 5 charging pins, 4 Torx screws, and various regulatory scrawl. On the right-hand side there is a power button, and a little further along than that there is a hole for the Gear's microphone. The watch band appears to be made of a rather stiff silicone with a pattern of banded vertical lines. The Gear comes in a variety of hues, but only the band and plastic shell are colored - the wrist hinge mechanism, speaker housing, and main watch housing are all stainless steel. The hinge and the sides of the speaker housing are polished, while the top of the speaker and the watch face are brushed. 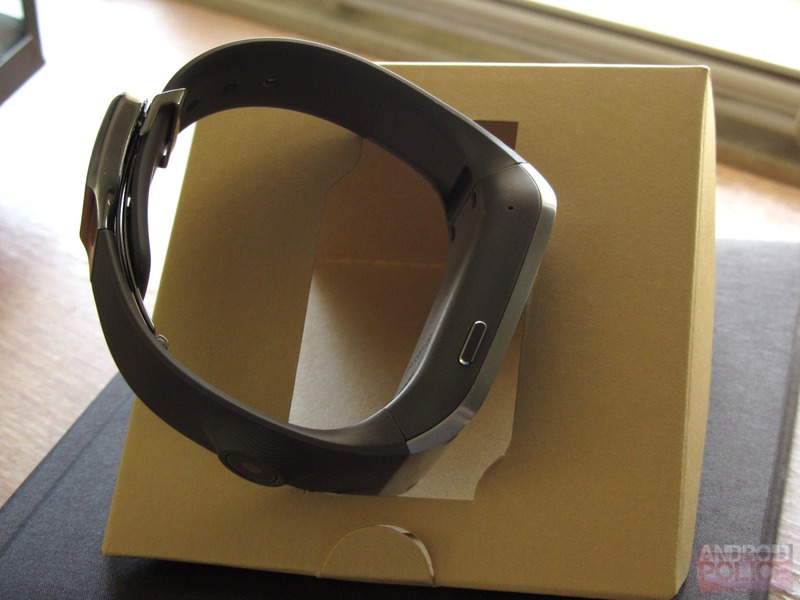 The Galaxy Gear, if nothing else, feels incredibly tough. The level of fit and finish is something I'm unaccustomed to from Samsung's smartphones. Everything seems very tightly-fitted and premium, not a single thing about the Gear feels cheap. Even the latching mechanism, which snaps shut with a very satisfying, metallic "click," is just right. The low point of quality would obviously be the wrist band, but even that doesn't really feel cheap so much as look it. Like I said, the band material is quite stiff, so it doesn't bend and stretch like the rubber straps of Casio yesteryear. I will say the Gear is a bit bulky. This is largely because of the speaker housing, which is actually on top of the wrist strap latch. I can't get the gear to easily slide under a long-sleeved shirt, or type on my laptop while wearing it (it scrapes against the edge). The top of the watch is also quite thick, though by modern day ridiculously-oversized-watchface standards, it's not that bad. The weight of the Gear isn't bothersome to me, and in most situations the size isn't something I've noticed. The actual fit of the watch is quite good - the stiff silicone bands squeeze your wrist a bit, keeping the Gear in place pretty well. I do think Samsung should probably look into some bigger sizes, though. I don't have gigantic wrists, but I'm on the 2nd-to-last hole in the band. If you're thinking about getting a Gear and you do have large wrists, definitely try it on beforehand if you can. 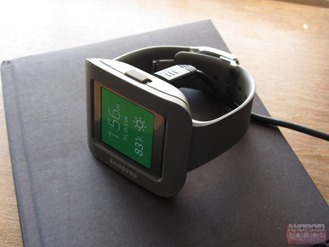 Another area where the Gear trounces most of its competitors (at least on paper) is the display - at 1.63" and 320x320, the Gear has an effective DPI of 277, easily besting even the brand-new Sony Smartwatch 2, which has a DPI of only 176. That means the Gear is more capable of displaying complex, fine-grain content without sacrificing on readability. I definitely do like the Gear's display, too. 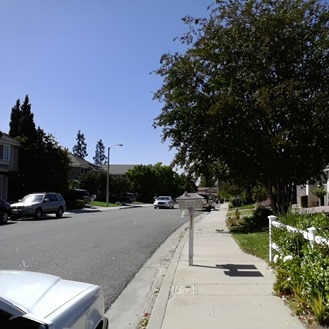 At maximum brightness (outdoor mode), assuming you're not at a really bad angle, it's readily visible outdoors. There are two big problems with it, though. First, because it's AMOLED, it uses more power than an LCD, especially at high brightness levels. As such, there has to be a display timeout set. The maximum is 5 minutes, but I imagine you'd run down your battery in a matter of a few short hours on that setting regardless of how much you actually use the watch (more on that soon), unless you have the brightness set to the very minimum. The default timeout is 7 seconds. So, how do you actually turn the display on? One of two ways. On the right-hand side of the Gear is a power button that will turn the display on or off (two taps for off if you're not on the watchface homescreen). The way you're supposed to do it, though, is with your wrist. 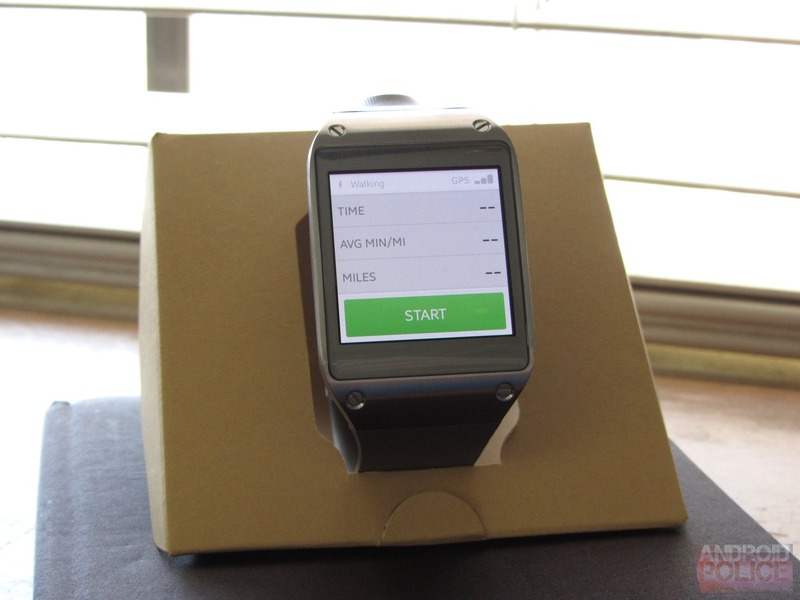 The Gear's accelerometer can tell when your wrist twists from its natural position (facing outward), to "I'm trying to look at my watch" (facing inward) position, at which point the display automatically illuminates. This works most of the time, with the latency being somewhere in the 0.5-1 second range. This does lessen the "glanceability" factor for me, particularly if I'm engaged in some other activity and just want to get the time really quickly - I have to wait for the display to come on. The wrist twist also works in reverse, so if the Gear thinks you're done with it, it'll dim briefly, then turn off, regardless of your screen timeout setting. The "off" motion seem much more picky, though (understandably), and unless your wrist is very still and turned outward enough relative to where it was previously, the display usually won't turn off until the set display timeout is reached. The other problem is setting the brightness, which has to be done manually. There's no ambient light sensor on the Gear, so if you want it brighter or dimmer, you have to tap twice with two fingers on the display to bring up the quick setting UI and adjust it. This seems like a truly tragic oversight. At least include a rotary dial or some kind of temporary high illumination mode button on the thing. Because of this, I leave the Gear at brightness level 4 (out of six, if you include outdoor mode) all the time, which isn't bright enough if you're standing outside on a sunny day, but fine in pretty much any other situation. This is going to vary heavily on a per-user basis. Because the Gear's battery is so small (315mAh), how you use the watch (have the display on or the processor working) will affect the rate of drain pretty dramatically. 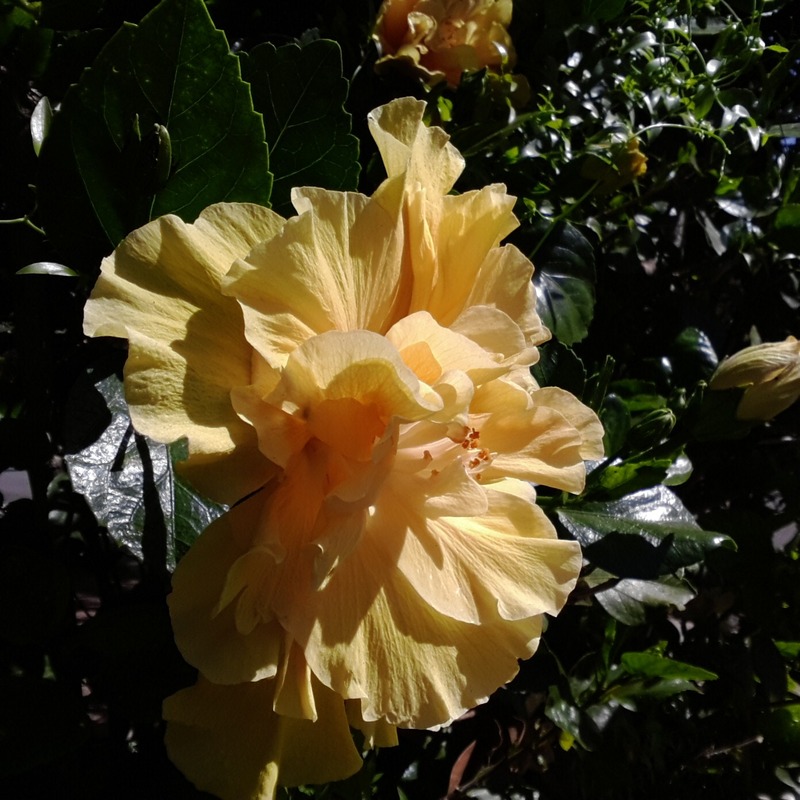 If you're constantly checking the pedometer or using the camera fairly often, you're probably going to run it down before a couple of days are over. But the biggest impact will still be the display itself - setting the timeout to a minute or two and the brightness up to 5 or outdoor will run down that little battery very, very quickly. Maybe even less than a day. But, if you use the default settings (brightness level 4, 7 second timeout), and aren't using the Gear for much more than the time of day and, occasionally, just messing around with it, I think 3 days is a pretty reasonable estimate of the sort of longevity you'll achieve. Just know that your results will vary. Oh, and charging the Gear. That's an adventure. 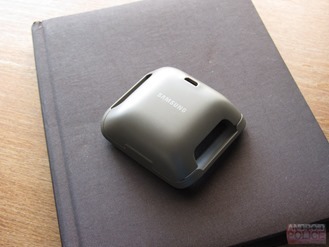 For all the quality and shiny metal that goes into the Gear itself, the small charging dock that is required to supply it power (remember, it's just pogo contacts on the watch) is made of the cheapest plastic Samsung could rummage out of the parts bin. Like, I am seriously afraid I will break the hinge you're required to open before sticking the Gear on the dock. Even by Samsung standards, it's bad. Anyway, you open the dock, you stick the watch inside, close it and then you just hook up any old microUSB cable like you normally would and away you go. It's a pretty involved process, if I'm honest - there had to be a more elegant way of doing this. 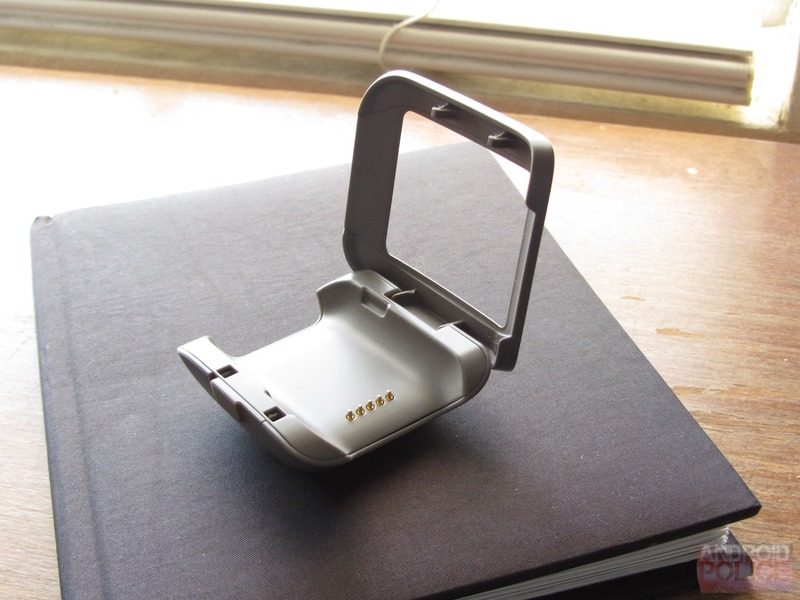 For $300, you'd think you could develop a little stand, or use wireless power like Qualcomm's Toq watch. The solution here feels very haphazard and corner-cutty. The Galaxy Gear has 4GB of internal storage, and all wireless communication is done via Bluetooth. 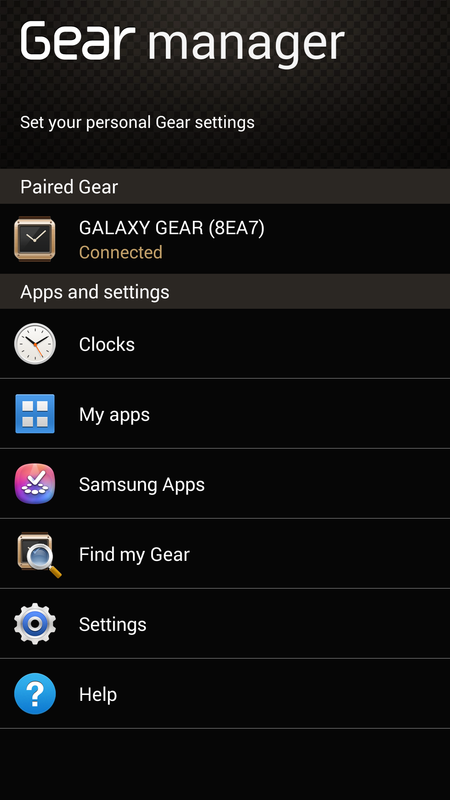 The Gear pairs, currently, only to the Galaxy Note 3 via a Bluetooth Smart (aka LE, or Low Energy) connection, which is designed to consume very little power. I think a large part of that is the fact that the BT Smart connection, when idle, transmits only every once in a while (maybe every 30-60 seconds) to check if the paired device is still active. As such, the connection really doesn't consume any meaningful amount of power unless you're using it for something like a phone call or a file transfer. The reliability of the connection is very strong, I've found. I've never had the Gear unpair itself from my Note 3 for any reason but going out of range of the phone (>10 meters), and then staying out of range for 30-60 seconds. The Gear then vibrates to let you know the connection has been lost. The initial pairing process is also a little unintuitive, in that you don't start with the watch, but the charging dock. The charging dock has a small NFC tag inside it, and if you bump it against the phone, you're prompted to then download the Galaxy Gear Manager app. Alternatively, just open up the Samsung app store and search for "gear manager," and that'll work just as well (no, it does not actually work on other phones). 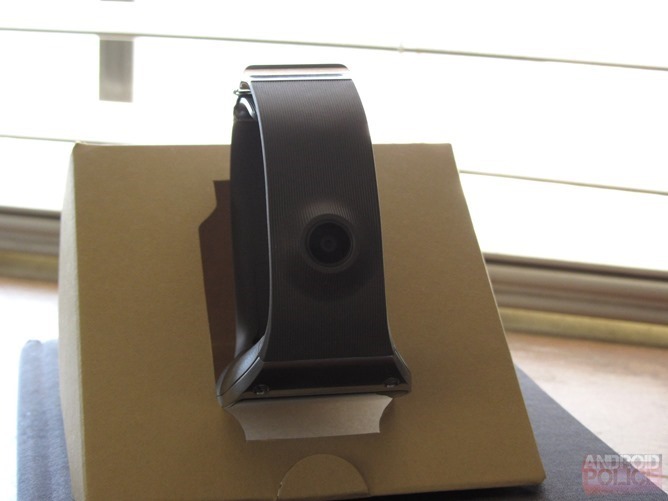 Once installed, you'll then want to turn on Bluetooth and connect to the Gear using your phone, at which point you'll get a PIN code on both devices to confirm you're pairing the right watch. That's it - you're done. It's pretty easy. Rounding out this section is call quality. Yes, you can make phone calls on the Gear. No, you really won't want to. Not only is holding the Gear up to your face incredibly awkward, it's also considerably less comfortable than you might think, and the loudspeaker is actually very loud indeed, making it nowhere near as private as just pulling out your phone. 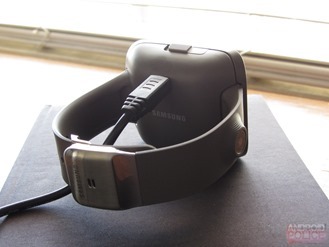 I think Samsung's objective here is to replace the Bluetooth earpiece (which AFAIK you can't use while simultaneously paired to the Gear), which I guess this achieves to some degree. If you're answering a call in the car, for example, the Gear would probably be safer to use than your phone, assuming you have auto-answer enabled while using a headset. Then again, having auto-answer enabled while using the Gear might not be such a great idea, since the call goes straight to loudspeaker. Anyway, it makes phone calls, and they're of a totally usable quality. Just know that A.) you'll look like a crazy person talking to his / her own hand, B.) it feels weird, and C.) everyone immediately around you can probably hear what the other person is saying. The 1.9MP sensor is usable in a pinch for outdoor photos or barcode scanning apps, but not much else. I guess it's nice to have, and everyone I've talked to and shown the Gear has almost immediately asked "Is that a camera?" with varying levels of excitedness / creeped-outness. So, the reaction is generally either "Cool!" or "Wow, stalkers will love it!" (note: the camera shutter tone, for said stalker reasons, cannot be muted). Anyway, here are some sample shots. Oh, and yes, the Gear does capture images in 1:1 aspect ratio. The thing is, the positioning of the camera is just all wrong. You'd think that having the camera perpendicular to the watch face would make sense, until you think about how your smartphone works. Imagine if the camera was on the top edge of your phone, pointing up instead of out the back. Now imagine trying to take a picture of something straight ahead while also still being able to see the screen. Yep. Not so great. The ideal position on a watch would probably be about 45 degrees lower, so at a 135 degree angle from the display. This would allow you to put the watch up to your face to see the viewfinder (which you kind of need to since the display is tiny) without having to crane your neck in various strange ways. Perhaps this just wasn't possible - maybe the ribbon cable for the camera couldn't handle the stress of so much bending - but it's the first thing I noticed when actually trying to use the Gear as a camera. I'm going to try to keep this simple, as the Gear's software is also quite simple. So let's start with the basics. The Gear's UI is, obviously, based on a touchscreen interface, and is laid out based largely on swiping left, right, up, or down. The best way to think of the Gear's OS is as illustrated by my colleague Liam, below. The clock is the primary homescreen - from there you can swipe left or right for various other items which have dedicated homescreens, too. 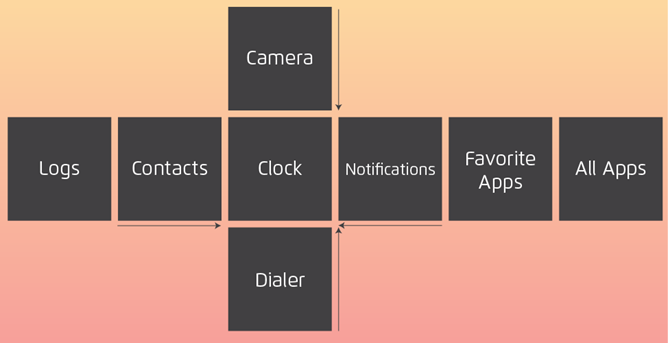 Any of them, aside from the clock, dialer, camera, and app drawer can be removed from this interface. You can also add new apps ("favorites") to the list. All of this is done on your connected phone through the Gear Manager app, but I'll cover that in another section. 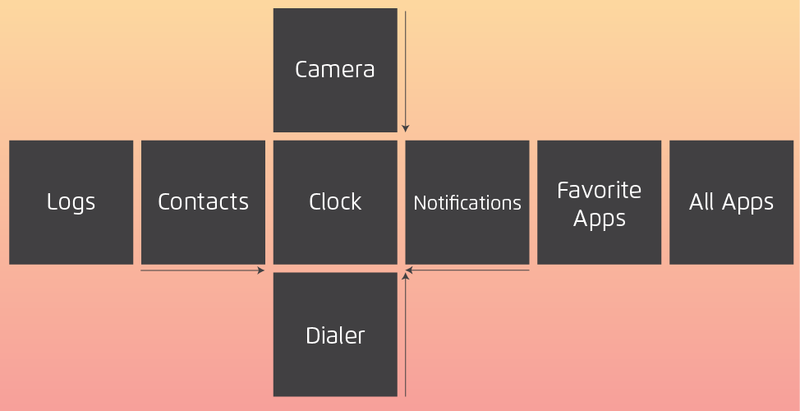 All of the core apps you're seeing here are pretty self-explanatory - logs is for call logs, contacts for contacts, the clock is -wait for it - a clock, notifications is where your notifications go (more on why this is incredibly stupid later), etc. You get where this is going. So, the more interesting question is how to get to those two odd men out - the dialer and the camera. Pull down from the top of the screen while you're on the clock homescreen to get to the camera. Pull up from the bottom while in the camera to go back. Pull down from the top of the screen while on the clock homescreen to get to the dialer. You get the picture. Pulling up from the bottom of any other homescreen does nothing, while pulling down from the top sends you back to the clock. This would be fine and dandy if the gestures were tuned and responsive enough that I wasn't constantly second-guessing if my up-swipe / down-swipe were detected, or the Gear was just taking its time in actually doing something about it. This makes interacting with the Gear a bit frustrating at times. But if I'm honest, this is such a minor problem compared to the rest of the Gear's deficiencies that I'm not going to dwell on it. 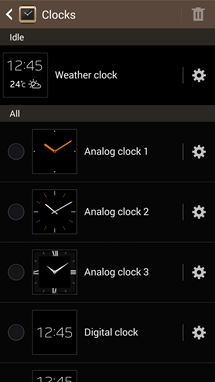 Gear Manager is the Android app through which you manage your Galaxy Gear. Clever name, right? You can update your Gear's firmware, manage apps, install new ones through the Samsung app store, locate your watch (assuming it's still connected), and adjust a few of the Gear's various settings. There is one legitimately useful thing I've found in the Gear so far, and it's a setting in this app. It's called auto lock. 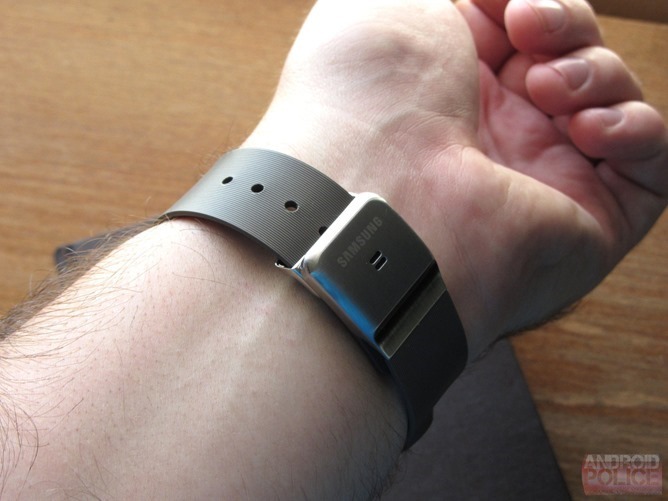 Auto lock is a brilliant idea - it uses your Galaxy Gear as a Bluetooth-based authenticator for your phone. If your phone isn't able to communicated with the Galaxy Gear at the moment you turn on the display, it will revert to a pattern lock (which you set). If the Gear is detected, just swipe to unlock. In the time I've had the Gear, the feature has been 95% reliable. That's to say, about 5% of the time the pattern lock lingers on the lockscreen for a few seconds before the Gear is detected, and then it reverts back to the swipe screen immediately. But when it's out of range, the pattern lock comes up every time, and that's what matters on a security feature like this. I think it's an excellent idea. I also don't think it's an idea that requires a $300 watch, so much as a $30 Bluetooth dongle on your keychain. Notifications are managed from the settings area of Gear Manager, but I'm going to give them a special spot in the next section. You can alter the double-press behavior for the Gear's power button, which by default launches S Voice, to launch pretty much any app on the Gear. Smart Relay is another notification feature, so we'll discuss it in the next section. Finally, there's a toggle for the wrist-twist gesture to turn on the display, even though Samsung says it works by lifting your arm. Yeah, it's doesn't - I can go straight up and down with my arm for days and nothing happens. You definitely need to twist the wrist, too. So this is what people want, right? Tight notification integration with their smartwatch and smartphone? Intelligent behaviors that can help you decide whether or not it's time to bust out your phone or just ignore that last vibration? 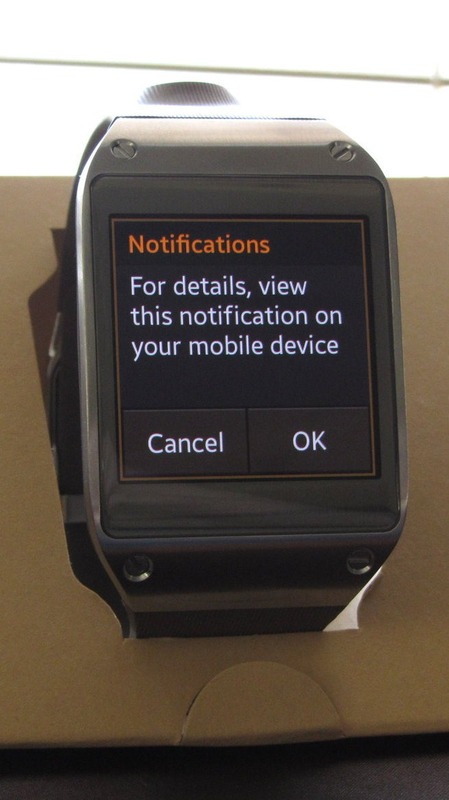 Well, here's the sobering reality of notifications on the Galaxy Gear: not only are they implemented poorly, they don't really work with most of the apps you'd want them to. 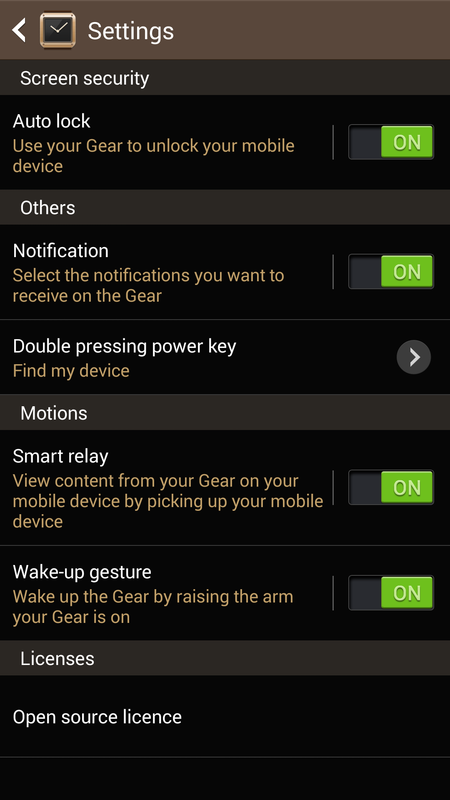 You can enable Gear-based notifications for any app installed on your Note 3. Sounds promising! What's not promised is any kind of quality to those notifications. For example, anything that isn't a Samsung app, essentially, will simply send a "blank" notification to the Gear. So if I get a new message in Gmail, I just get a notification that basically says "hey, Gmail sent you a notification." No other information. Not account, sender, subject, or body preview. When you get a notification, you can either have a ringtone set or just use vibration. I definitely prefer the latter. So let's say you're at dinner and you feel your watch vibrate and think "ah, a notification, I'll have to check that in a minute after I've finished my food." So a minute later your twist your wrist up, and what do you see? The clock face! With absolutely nothing to show you received a notification. To see your notifications, your have to swipe to the notification homescreen, which is equally useless at conveying anything resembling a useful amount of information - there's just a little number showing how many notifications you have. Tap on it. Let's say it was a Gmail message, meaning I just get a Gmail icon, a time, and a little "1" to the right of it that actually doesn't indicate unread count or number of new messages or, seemingly, anything at all (it may with Samsung apps, it doesn't with Gmail). So you tap on it. Still no information, but an offer to automatically unlock your phone and pull up the notification in question there so you can read the email which can't be displayed on the watch. Great! Well, once again, we're just shy of having it really doing anything useful - the Gmail app does open up on your phone, but it'll just be the primary inbox of the last account you used with the app, not the message you received. You can also have this behavior automate to an extent if you're real quick on the draw with Smart Relay - while the initial notification is still displaying on the watch, pick up your phone and the same thing that happens - you get sent straight to Gmail. Well, most of the time, when it works. It doesn't always work. Frankly, the Gear's notification handling is like having a conversation with someone with severe amnesia. 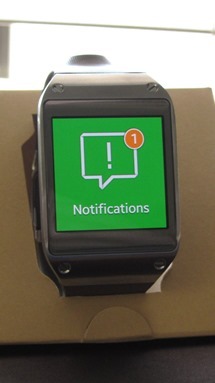 Galaxy Gear: Hey, you have a notification! Galaxy Gear: Hi, I'm Galaxy Gear, here's a watchface! 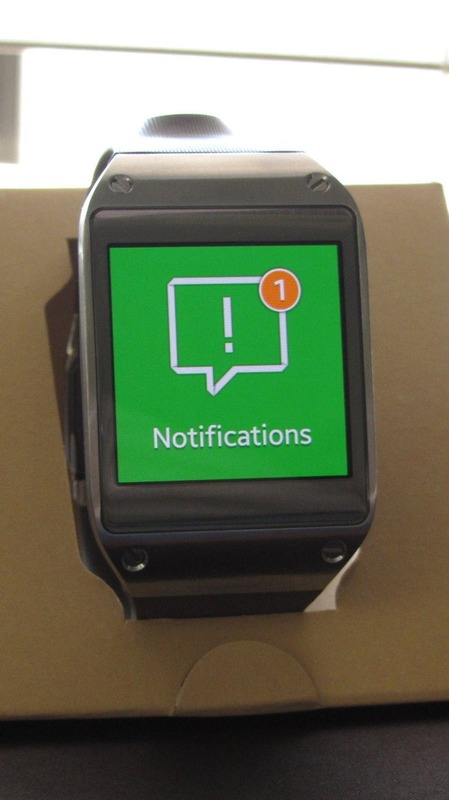 Galaxy Gear: What notification? I don't remember that. 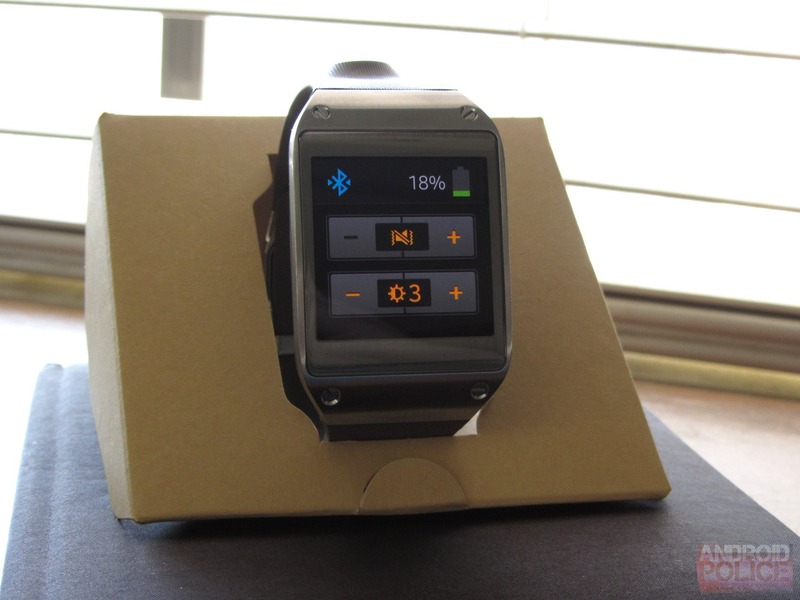 Galaxy Gear: I have no idea! It all sounds neat in concept, but in practice, the way the Gear handles notifications is just so incredibly clunky and half-functional that there's no way it's actually going to save you any time. It just doesn't feel ready. The one way to speed this process up is the multi-tasking interface, which is pretty much just like stock Android's. Long-press with two fingers anywhere on the screen to bring up the recent apps menu. By the way, who's going to figure that out without reading the manual? The double two-finger tap to get quick brightness / volume settings is hard enough. Here's where things get real sticky for the Gear in terms of justification for existence. 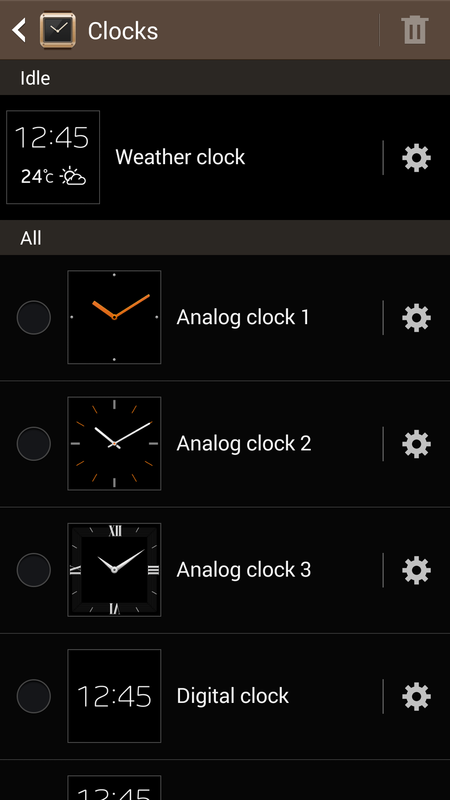 Right now, not counting custom clockfaces, there are maybe two dozen Galaxy Gear apps on Samsung's app store. I actually even use one of them on my phone normally - RunKeeper. The RunKeeper app for Galaxy Gear also requires you to have the Samsung Apps version of RunKeeper for your phone installed, not the Google Play version. This is true for some, but not all, apps on the Galaxy Gear. The RunKeeper Gear app does four things - allows you start the last activity you used on your phone again (though you can't select a specific workout or even change the activity type), see your current split times, take a picture, and see basic stats after you finish a workout. In order to function, the RunKeeper app for Gear uses your phone's GPS, since the Gear doesn't have GPS. In what way does this help me at all? If I'm taking the Gear, I have to take my phone, too. I can't access the pause / stop button for the workout activity any quicker on the Gear than I do my phone (which is in my hand anyway), I can't play or pause music any more quickly on the Gear (getting to media controls means turning on the watch, swiping to media controller, tapping on it, then using the media controls), and the Gear isn't doing anything to augment RunKeeper's accuracy or increase my phone's battery life by offloading the GPS. The Gear, in this situation, is doing nothing to help me. This is the problem I run into time and again with this product - it doesn't actually help me do anything. 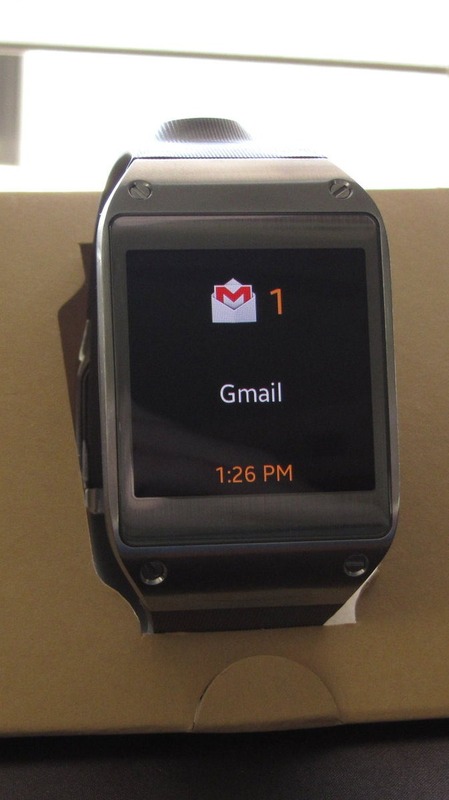 It's just a fancy touchscreen watch that I occasionally look at and go "what exactly are you... for?" And I think app developers are asking the same question. You can't just slap together a Gear app that does X, Y, and Z just like the normal phone app but worse and more limited. That doesn't suddenly make a smartwatch app useful. 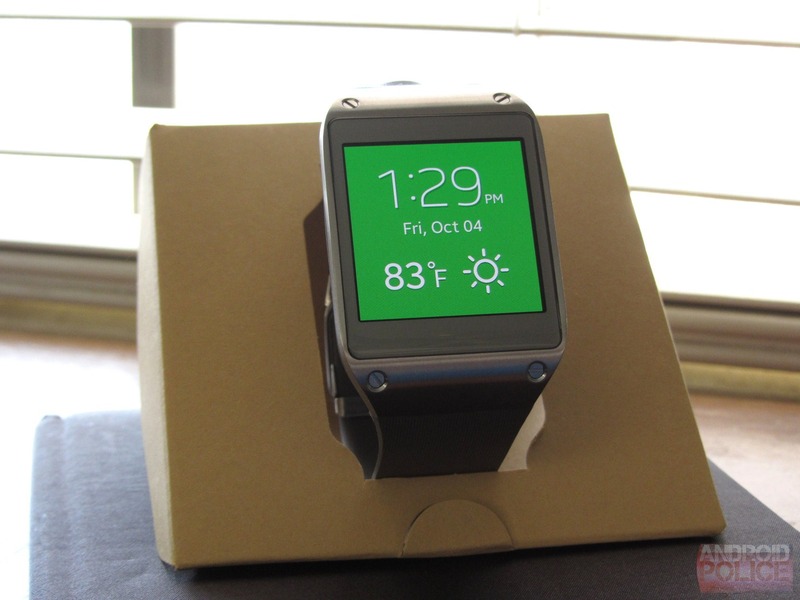 Look at eBay's Gear app - it just sends eBay notifications to the watch. Why am I going to whip out my watch, swipe over to the eBay app, tap on it, and then look through a tiny list of notifications when I can do the same thing on my smartphone in an equal or lesser amount of time in an app that gives me more information in a more readable fashion? It seems like functionality for the sake of it, not anything that actually makes my life any easier or more convenient. Using the Gear has made me aware of a few things I think aren't terribly obviously about smartwatch ownership (well, Gear ownership), and the benefits and drawbacks thereof. So let me elaborate on that. You pretty much have to take it off in a movie theater or otherwise put it somewhere where it's not going to randomly illuminate. Unless you turn off the wrist detection gesture in the Gear Manager app (inconvenient!) even level 1 brightness is going to be very noticeable in that kind of venue. Wearing the Gear while driving a car at night can be distracting - just using the steering wheel as you normally would will cause it to illuminate sometimes, which will catch your eye and probably distract you momentarily. Yet another scenario where I was often forced to take it off. Forgetting to charge it (or forgetting the charging cradle) means you have a useless lump on your wrist that can't tell the time but also doesn't make a very good fashion accessory. So many things the Gear does can be accomplished as or almost as quickly by just pulling out your phone, and your phone will almost invariably do all of said things a lot better. Having a smartwatch that doesn't have an always-on display mode for at least a basic watchface seems kind of, well, dumb. At no point have I actually found something the Gear does to be compelling enough that I actually want to wear it. It is more burden than benefit. Because it's a smartwatch, you're probably going to fiddle with it more than a regular watch. If you do this in company (eg., look down at it and turn it on), people will think you're saying "I need to go / I'm in a hurry" with all the subtlety of a polar bear in a sausage factory. If you have $300 to throw at a stainless steel smartwatch that currently pairs with one phone and really doesn't do anything all that useful, the Galaxy Gear may be for you. I admit, I'm not going to be the first person to get excited when Google or Apple unveil a smartwatch, either - I'm skeptical of the whole concept. 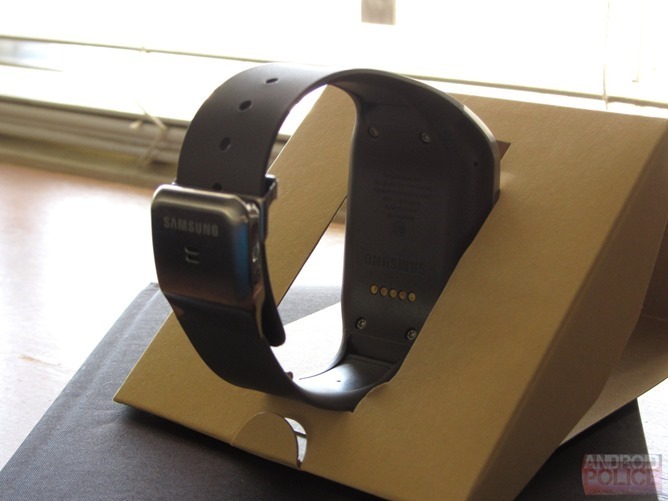 But Samsung's execution here is just so off that I think even people who want smartwatches should avoid this device. It's a generation one product in a relatively new product category. Buying the Gear is throwing your money at an experiment, and as consumer product experiments go, it's just not a very exciting or ambitious one. 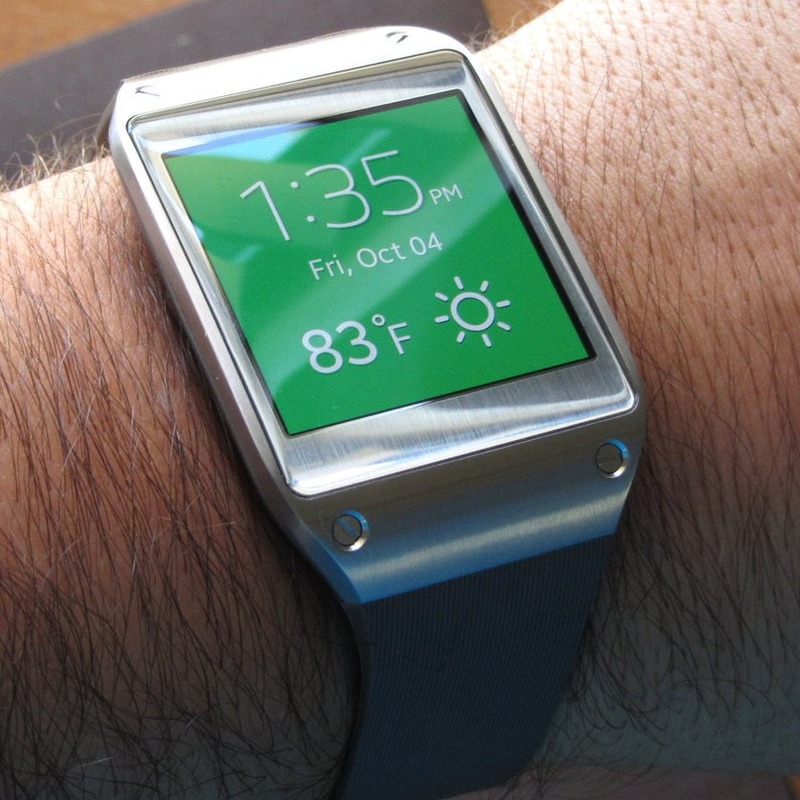 Maybe the Gear 2 will wow us, but for now, Samsung's competitors have little to fear. The Gear's price will scare off most prospective buyers, and I can imagine the ones they do sell will quickly find their way into drawers, or more likely, onto eBay.